Of 67 patients who met inclusion criteria and agreed to participate in the study, 34 were randomized to receive placebo and 33 to receive ramelteon. The Kaplan-Meier estimates of the interval to the development of delirium were 6.94 (95% CI, 6.82-7.06) days for patients receiving ramelteon and 5.74 (5.05-6.42) days for those receiving placebo. Comparison by log-rank test showed that delirium developed significantly less frequently in the ramelteon group (χ2 = 9.83; P = .002). American Psychiatric Association. Diagnostic and Statistical Manual of Mental Disorders.4th ed. Washington, DC: American Psychiatric Association; 1994. Dear Editor, We have read the article “Preventive Effects of Ramelteon on Delirium” by Hatta et al.1 with great interest. They have conducted a randomized placebo-controlled trial among a total of 67 elderly patients newly admitted due to serious medical problems. Subjects were randomly assigned to receive ramelteon or placebo every night for 7 days. They reported a lower risk of delirium (3% vs 32%; P = .003) in the ramelteon group. Consequently, they concluded that ramelteon administered nightly to elderly patients admitted for acute care may provide protection against delirium and their finding supports a possible pathogenic role of melatonin neurotransmission in delirium. We do appreciate the painstaking nature of their study and their remarkable result on effectiveness of ramelteon in prevention of delirium. However, we suggest that there are some limitations of the study which should be considered while interpreting the study results.In results section, they reported that 3 patients (9%) in the placebo group and 6 patients (18%) in the ramelteon group received hydroxizine as needed, with no significant difference in the rate of use between groups. Delirium developed in only 1 of these 9 patients on hydroxizine therapy, resulting in a delirium incidence of 1/9 (11.1%). As the authors noted, the proportion of patients with delirium in the placebo group was similar to what would be expected in this patient population as 32%. The lower incidence of delirium in hydroxizine group compared to the –what would be expected- is also remarkable as 11.1% vs 32%. Such a difference in expected and observed delirium by addition of a study drug may be already significant as was in the melatonin trial by Al-Aama et al.2 This finding may suggest protective effect of hydroxizine treatment- another known drug with sleep improving efficacy- by itself in prevention of delirium. Sleep restoration by several means has already emerged as a factor in preventing development of delirium in a recent meta-analysis of randomized trials.3 Hatta et al.1 stated that study nurses provided all patients equally with non-pharmacological preventive care. 1 However, among all the prevention intervention protocols, sleep protocol is the one with least complete adherence rates while adherence demonstrates a consistently strong and significant protective effect against delirium4. Therefore it is unlikely to suppose that sleep characteristics have been effectively managed by non-pharmacological measures. They have given an active drug -the ramelteon- known to improve sleep in this population and approved for the treatment of insomnia. 5 Hatta et al. analyzed sleep-metrics subjectively based on patient reports, nursing observations and records, and rater observations.1 As the authors have already noted, although their findings did not suggest any benefit of ramelteon for sleep parameters, larger samples are needed to statistically differentiate drug from placebo in studies based on self-report6 and their study was limited by its relatively small sample size. Remarkably, although the difference was non-significant, “difficulty falling asleep” was less in the ramelteon group than the placebo (30% vs 41%) -that is the indication it is approved for . This finding suggest the sleep improving effect of the ramelteon also in the study participants which could not be proved statistically due to the small number of patients to analyze as in other measures already depicted in the manuscript. The many other agents having sleep improvement effect as trazadone, antipsychotics, melatonin, dexmedetomidine sedation, bright light therapy, diazepam, flunitrazepam and pethidine also demonstrated effect in preventing delirium 2,3,7-9. We conclude that, -based on the aforementioned arguments- the proposition that their finding supports a possible pathogenic role of melatonin neurotransmission in delirium, is difficult and would be an over-interpretation of the study results. Ramelteon’s delirium preventing effect most probably may be due to their effect on sleep which was a mechanism also suggested by Lewis and Barnett for melatonin’s preventing effect. 10 References1.Hatta K, Kishi Y, Wada K, et al. Preventive Effects of Ramelteon on Delirium: A Randomized Placebo-Controlled Trial. JAMA Psychiatry. 2014;71(4):397-403.2. Al-Aama T, Brymer C, Gutmanis I, et al. Melatonin decreases delirium in elderly patients: a randomized,placebo-controlled trial. Int J Geriatr Psychiatry. 2011;26(7):687-94.3. Hao Zhang, Yan Lu, Meng Liu, et al. Strategies for prevention of postoperative delirium: a systematic review and meta-analysis of randomized trials. Crit Care. 2013;17(2): R47.4. Inouye SK, Bogardus ST Jr, Williams CS, Leo-Summers L, Agostini JV. The role of adherence on the effectiveness of nonpharmacologic interventions: evidence from the delirium prevention trial. Arch Intern Med. 2003;163(8):958-64.5. Roth T, Seiden D,Wang-Weigand S, Zhang J. A 2-night, 3-period, crossover study of ramelteon’s efficacy and safety in older adults with chronic insomnia. Curr Med Res Opin. 2007;23(5):1005-1014.6. Belanger L, Vallieres A, Ivers H, et al. Meta-analysis of sleep changes in control groups of insomnia treatment trials. J Sleep Res. 2007;16(1):77-84.7. Okamoto Y, Matsuoka Y, Sasaki T, Jitsuiki H, Horiguchi J, Yamawaki S. Trazodone in the treatment of delirium. J Clin Psychopharmacol. 1999;19(3):280-282.8. Ono H, Taguchi T, Kido Y, Fujino Y, Doki Y. The usefulness of bright light therapy for patients after oesophagectomy. Intensive Crit Care Nurs. 2011;27(3):158-66.9. Aizawa K, Kanai T, Saikawa Y, et al. A novel approach to the prevention of postoperative delirium in the elderly after gastrointestinal surgery. Surg Today. 2002;32(4):310-4.10. Lewis MC, Barnett SR. Postoperative delirium: the tryptophan dyregulation model. Med Hypotheses. 2004;63(3):402-6. Importance No highly effective interventions to prevent delirium have been identified. Objective To examine whether ramelteon, a melatonin agonist, is effective for the prevention of delirium. Design, Setting, and Participants A multicenter, rater-blinded, randomized placebo-controlled trial was performed in intensive care units and regular acute wards of 4 university hospitals and 1 general hospital. Eligible patients were 65 to 89 years old, newly admitted due to serious medical problems, and able to take medicine orally. Patients were excluded from the study if they had an expected stay or life expectancy of less than 48 hours. Interventions Sixty-seven patients were randomly assigned using the sealed envelope method to receive ramelteon (8 mg/d; 33 patients) or placebo (34 patients) every night for 7 days. Main Outcomes and Measures Incidence of delirium, as defined by the Diagnostic and Statistical Manual of Mental Disorders (Fourth Edition). Results Ramelteon was associated with a lower risk of delirium (3% vs 32%; P = .003), with a relative risk of 0.09 (95% CI, 0.01-0.69). Even after risk factors were controlled for, ramelteon was still associated with a lower incidence of delirium (P = .01; odds ratio, 0.07 [95% CI, 0.008-0.54]). The Kaplan-Meier estimates of time to development of delirium were 6.94 (95% CI, 6.82-7.06) days for ramelteon and 5.74 (5.05-6.42) days for placebo. Comparison by log-rank test showed that the frequency of delirium was significantly lower in patients taking ramelteon than in those taking placebo (χ2 = 9.83; P = .002). Conclusions and Relevance Ramelteon administered nightly to elderly patients admitted for acute care may provide protection against delirium. This finding supports a possible pathogenic role of melatonin neurotransmission in delirium. Delirium represents an acute change in cognition with altered consciousness and impaired attention that fluctuates over time.1 The prevalence of delirium is 11% to 33% on admission, and the incidence during hospitalization is 3% to 56% among elderly patients presenting to emergency departments or medical and surgical wards in general hospitals.2-5 With the increase in the aged population, further increases in delirium seem likely. However, no medications against delirium have yet been approved. Delirium prevention has been investigated in several randomized clinical trials (RCTs). 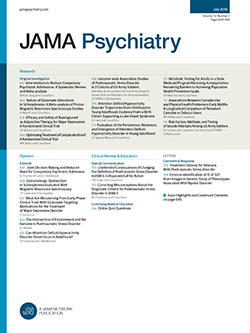 Based on a single RCT, programs for proactive geriatric consultation may reduce the incidence and severity of delirium in patients undergoing surgery for hip fracture.6,7 In contrast to the lack of efficacy of cholinergic enhancement in preventing delirium,8-10 some benefits of antipsychotics have been shown.11-13 However, physicians may hesitate to use antipsychotics for delirium prevention given the risk of adverse effects. Melatonin, a pineal gland hormone that regulates the sleep-wake rhythm, is reportedly associated in an RCT with a lower risk of delirium.14 Ramelteon, an agonist of melatonin that has been approved by the US Food and Drug Administration for the treatment of insomnia characterized by difficulty at sleep onset, has been suggested as an option for preventing delirium in case series.15-17 We examined whether ramelteon has effects in preventing delirium in elderly patients. This randomized placebo-controlled trial was conducted from September 1, 2011, through October 31, 2012, in 4 university hospitals and 1 general hospital. All study protocols were approved by the institutional review board at each site, and written informed consent was obtained from patients or their proxy decision makers. This activity was conducted by the DELIRIA-J (Delirium Intervention Research for Improving Acute phase outcomes in Japan) study group. Eligible patients were 65 to 89 years old, newly admitted due to serious medical problems, and able to take medicine orally. Patients were admitted via emergency departments to intensive care units or regular acute wards. Patients were excluded from the study if they had an expected stay or life expectancy of less than 48 hours. The observation period was 1 week, and we considered that it would be difficult during such a short time to discriminate between delirium and cognitive fluctuation in certain diseases, such as severe liver dysfunction or Lewy body disease. Patients with such diseases were therefore excluded in advance. Fluvoxamine is known to interact with ramelteon as a major interaction. Withdrawal syndromes associated with alcohol dependency and drug abuse can include delirium, obviously differing etiologically from delirium caused by systemic diseases. Patients with psychotic or bipolar disorders are usually receiving treatment with antipsychotics, which may prevent the development of delirium. Patients with other mood disorders are also often treated with antipsychotics, so they were also excluded. Patients were approached before the first night after admission; those who were already delirious at admission were excluded. We intended to perform this RCT in emergency situations. Although double blinding is ideal, we supposed that the participation rate of patients with such a design would have been much lower than with single blinding. The lower the participation rate, the less representative the results would be for real-world practice. We therefore chose to use only rater blinding. Patients were randomized using the sealed envelope method in a rater-blind manner to receive either ramelteon or placebo. For randomization, we referred to a random number table, with sequentially numbered, opaque, sealed envelopes used to conceal the allocation sequence. Study medication was managed by nurses and administered daily at 9 pm. This regimen was continued until the development of delirium or up to 7 days. The physician in charge kept the randomization code, and no rater became aware of treatment allocations until requesting unmasking on December 12, 2012. Nurses were blinded except those who managed the study medication. Nurses provided all patients equally with preventive care, such as avoidance of immobilization, adequate lighting, noise reduction, on-time clocks and calendars, and regular verbal communication. Other staff, such as physiotherapists, were blinded. Family members were not allowed to stay in hospitals after 8 pm, and study medication was given at 9 pm. Therefore, there was low likelihood of bias due to interactions with family members. Thus, neither nursing care nor family interactions could have been different in the ramelteon group. The dosage of ramelteon was 8 mg/d, given as a single tablet nightly, representing the standard dosage for the approved indication of sleep disturbance. The placebo comprised 330 mg of lactose powder. The placebo did not match the ramelteon active agent in appearance. This was a shortcoming of the study, but we considered that this drawback would have little effect on the development of delirium, which is characterized by impaired consciousness, including attention and awareness. We had to select an as-needed drug for patients who would show insomnia and require a sleeping pill because we intended to perform the trial in real-world practice. We discussed which drug would be optimal for this purpose among trazodone, zolpidem, zopiclone, and hydroxyzine. Trazodone is often used to treat delirium in Japan because Japanese researchers have reported a case series showing the efficacy of trazodone against delirium.18 The effects of trazodone could thus have masked the preventive effects of ramelteon. Although zolpidem and zopiclone are not listed in the Beers criteria,19 the Japanese package inserts for these drugs list adverse effects including delirium, confusion, hallucinations, excitement, disinhibition, aggression, abnormal behavior, and twilight state. In practice, we sometimes encounter elderly patients with delirium induced by these drugs. In contrast, we have seldom encountered elderly patients with delirium induced by hydroxyzine. We therefore suppose that zolpidem and zopiclone could have exaggerated differences in outcome between the active and placebo arms more than hydroxyzine, and would be less ethical to prescribe than hydroxyzine owing to the higher risk of inducing delirium, based on our experience. Because hydroxyzine is approved by the Ministry of Health, Labour and Welfare in Japan, all institutional review boards approved its use for such purposes. Hydroxyzine reportedly has low affinity for muscarinic receptors (mean [SD] inhibition constant [Ki], 3800  nmol/L) in the bovine cerebral cortex.20 The pharmaceutical company producing hydroxyzine (Atarax; Pfizer Japan Inc) informed us that they had no human data on the Ki values of hydroxyzine for the muscarinic receptor because it was an old drug. Data on inhibition constants of hydroxyzine for muscarinic acetylcholine receptors in humans thus seem to be lacking. Although the Beers criteria19 listed hydroxyzine as a strong anticholinergic drug, available data indicate that it has weak anticholinergic effects. We thus chose it as an as-needed drug for patients with insomnia who required a sleeping pill, with a nightly dose limit of 25 mg, as needed for insomnia. Data were collected on standardized forms and statistical analyses were performed using SPSS, version 20-J, software (IBM Japan). Differences between categorical variables in patient demographics and clinical characteristics were calculated by using Fisher exact tests. Differences between sequential variables were calculated by using unpaired t tests (with Welch correction if applicable). If data were not sampled from gaussian distributions, a nonparametric test (Mann-Whitney test) was used. Kaplan-Meier curves were used to estimate the probability of delirium at 7 days. We constructed multivariate logistic regression models to control for risk factors in estimating independent associations between the effects of ramelteon and the outcome of delirium as an exploratory analysis. All statistical tests were 2 tailed. Differences were considered statistically significant at P < .05. The incidence of delirium during hospital stays reportedly ranges between 3% and 56%.5 Although patients with risk factors for delirium (eg, old age and dementia) are increasingly encountered in general hospitals, we thought that 56% was too high an incidence of delirium during general hospital stays in Japan. We therefore assumed that the incidence of delirium in patients receiving placebo would be half the upper limit (ie, 28%) and the incidence in those receiving ramelteon would be the lower limit (3%). To enable detection of differences, we set the statistical power as 1 − β = 80% and the sensitivity as α = 5%. Through power analysis, we consequently set the required number of patients at 32 patients per group. During the study period, 1126 patients were assessed for eligibility; 1059 were excluded. Of the 697 patients admitted to intensive care units, 658 were intubated or had a life expectancy of less than 48 hours, and 306 of the 429 patients admitted to regular acute wards had an expected stay of less than 48 hours. Diagnoses of severe liver dysfunction, Lewy body disease, alcohol dependency, psychotic disorder, or bipolar disorder accounted for exclusion of 61 patients. As a result, 1025 patients did not meet the inclusion criteria. In addition, 3 patients admitted to intensive care units and 31 admitted to regular acute wards refused to participate. Thus, 67 patients (24 admitted to intensive care units and 43 admitted to regular acute wards) were included in the study. Figure 1 shows the trial profile. The 67 patients were randomly assigned to the 2 treatment groups (Figure 1). The rate of study participation among eligible patients was 66% (67 of 101). No patients withdrew consent, and all were therefore included in the final analysis. Baseline characteristics of randomized patients were much the same in both groups (Table 1). Table 2 shows outcomes. Five patients in the placebo group and 8 in the ramelteon group were discharged before 7 days, but none were discharged within 48 hours after admission. One patient in the placebo group discontinued the study drug owing to worsening of pneumonia, which was the admitting diagnosis. Six patients (18%) in the placebo group and 8 (24%) in the ramelteon group discontinued the study drug without delirium before 7 days. No significant difference in rate was seen between groups (P = .56). Delirium occurred in 11 patients in the placebo group and 1 patient in the ramelteon group. Figure 2 shows scattergrams of the highest total DRS-R98 score in each patient. Two patients with dementia in the placebo group with scores of 17 and 19 did not have a diagnosis of delirium according to the Diagnostic and Statistical Manual of Mental Disorders (Fourth Edition).1 Ramelteon was associated with a lower risk of delirium (3% vs 32%; P = .003), with a relative risk of 0.09 (95% CI, 0.01-0.69). No adverse events potentially attributable to the study drug were observed. As shown in Table 2, 3 patients (9%) in the placebo group and 6 (18%) in the ramelteon group received hydroxyzine (as needed), with no significant difference in the rate of use between groups. Delirium developed in only 1 of these 9 patients, a patient from the placebo group. Even when we excluded patients who received hydroxyzine, the rate of delirium was significantly lower in the ramelteon group than in the placebo group (4% [1 of 27 patients] vs 32% [10 of 31]; P = .007). Age, diagnosis of dementia, and history of delirium are known risk factors for delirium. Among patients without a history of delirium, the rate of delirium was significantly lower in the ramelteon group than in the placebo group (0% [0 of 29 patients] vs 30% [10 of 33]; P = .001), suggesting that ramelteon is effective in preventing delirium in patients without any history of it. Among patients with a history of delirium, there was no significant difference in the rates of delirium between the ramelteon and placebo groups (25% [1 of 4 patients] vs 100% [1 of 1]; P = .40), suggesting that the number of patients was too small to analyze. As shown in Table 1, although no significant difference in the rate of infection was identified between the ramelteon and placebo groups, the P value for this difference was the lowest for all admission diagnoses. We thus constructed multivariate logistic regression models to control for the effects of risk factors (eg, age, diagnosis of dementia, and admission diagnosis of infection) on the estimate of an independent association between ramelteon effects and the outcome of delirium. Even after we controlled for those risk factors, ramelteon was still associated with a lower incidence of delirium (P = .01; odds ratio, 0.07 [95% CI, 0.008-0.54]). Kaplan-Meier estimates of the time to development of delirium were 6.94 (95% CI, 6.82-7.06) days for ramelteon and 5.74 (5.05-6.42) days for placebo (Figure 3). Comparison by log-rank test showed that delirium developed significantly less often among patients taking ramelteon than among those taking placebo (χ2 = 9.83; P = .002). Outcomes of sleep metrics during study drug administration are shown in Table 2. Unexpectedly, there were no apparent significant differences between groups in any items. The present finding that acutely ill elderly patients receiving ramelteon were at lower risk of delirium than those receiving placebo (3% vs 32%) is remarkable because the effect seems to exceed that previously reported for melatonin (12% for melatonin vs 31% for placebo).14 In vitro studies have demonstrated that ramelteon has 6-fold and 3-fold higher affinities for melatonin receptors 1 and 2 (MT1 and MT2), respectively, compared with melatonin.28 The ramelteon dose in the current study was 8 mg, compared with 0.5 mg for melatonin in the previous study. Therefore, with respect to affinities for MT1 and MT2 receptors, ramelteon in the current study was 96-fold and 48-fold more potent, respectively, than melatonin in the previous study, which may explain its superiority in preventing delirium. These findings suggest that reduced frequency of delirium is associated with higher affinities for the MT1 and MT2 receptors, supporting a possible pathogenic role of melatonin neurotransmission in delirium. The MT1 receptor reportedly mediates acute inhibition of firing from the suprachiasmatic nucleus by melatonin,29 and activity at the MT2 receptor has been associated with the phase-shifting effects of melatonin on circadian rhythms.30 Among speculated causes of delirium, such abnormalities mediated by melatonin neurotransmission might be clinically important, particularly for delirium prevention. A strong decline in melatonin levels during aging has been consistently reported by many investigators.31 Among older adults with chronic insomnia, ramelteon at both 4 and 8 mg reportedly produced significant sleep-promoting activity, as indicated by polysomnographically recorded reductions of latency to persistent sleep, prolongation of total sleep time, and improvements in sleep efficiency.32 Although our present findings did not suggest any benefit of ramelteon for sleep parameters (Table 2), larger samples are needed to statistically differentiate drug from placebo in studies based on self-report compared with polysomnographic studies.33 From the current findings, it is therefore unclear whether the preventive effects of ramelteon on delirium are associated with its sleep-promoting activity. In addition to its efficacy, ramelteon was well tolerated by acutely ill patients. In prior studies, only 3 events have been reported to occur at an incidence at least 2% higher with ramelteon (8 mg) compared with placebo: somnolence (5% for ramelteon vs 3% for placebo), dizziness (5% vs 3%), and fatigue (4% vs 2%).28 No adverse events potentially attributable to the study drug were observed in our study. Lack of abuse liability has also been reported,34 so ramelteon can be used safely even for delirium prevention. Our study has several strengths, including the randomized and placebo-controlled design. The 2 groups were well balanced in terms of known delirium risk factors, and the proportion of patients with delirium in the placebo group was similar to what would be expected in this patient population. Another strength was that all participants had serious medical problems that required admission, mirroring real clinical practice. Although all patients were emergency admissions, the participation rate was nevertheless high. Because eligible patients were able to take medicine orally, their consciousness was not impaired. Many patients might thus have understood the significance of this study and been willing to participate in a placebo-controlled trial despite serious medical problems. Another explanation for the high participation rate may be that this study was rater blinded but not double blinded. Absence of support from pharmaceutical companies was another characteristic of our study. One limitation of our study was the relatively small sample size, although the number of participants was above the required number set by power analysis. Because of overfitting in the logistic regression analysis, a larger sample would be needed to perform more extensive multivariate analyses. Another limitation was the single-blind design. However, physicians and patients may not have had expectations about the occurrence of delirium, in which case the choice of a double-blind or rater-blind design would not have influenced the primary outcomes of delirium occurrence. Nevertheless, the lack of double blinding may bias results in favor of the active treatment. To our knowledge, our study is the first to investigate the preventive effects of ramelteon on delirium. Ramelteon was associated with lower risk of delirium, even after controlling for risk factors. Ramelteon administered nightly to elderly patients admitted for acute care may provide protection against delirium. This finding supports a possible pathogenic role of melatonin neurotransmission in delirium. More studies performed in real clinical practice with minimal bias are required to help physicians make rational decisions about delirium prevention. Submitted for Publication: April 23, 2013; final revision received August 11, 2013; accepted August 12, 2013. Corresponding Author: Kotaro Hatta, MD, PhD, Department of Psychiatry, Juntendo University Nerima Hospital, Takanodai 3-1-10, Nerima-ku, Tokyo 177-8521, Japan. Published Online: February 19, 2014. doi:10.1001/jamapsychiatry.2013.3320. Author Contributions: Dr Hatta had full access to all the data in the study and takes responsibility for the integrity of the data and the accuracy of the data analysis. Analysis and interpretation of data: Hatta, Wada, Takeuchi, Odawara, Usui, Nakamura. Critical revision of the manuscript for important intellectual content: Hatta, Wada, Takeuchi, Odawara, Usui, Nakamura. Statistical analysis: Hatta, Usui, Nakamura. Administrative, technical, or material support: Hatta, Kishi, Nakamura. Conflict of Interest Disclosures: Dr Hatta reports receiving honoraria from Eli Lilly, Janssen, Dainippon-Sumitomo, Otsuka, Astellas, Tanabe-Mitsubishi, and Meiji and serving as a consultant for Eli Lilly and Janssen. Dr Kishi reports receiving honoraria from Jannsen, GlaxoSmithKline, Shionogi, Merck Sharp & Dohme, Otsuka, Pfizer, Mochida, Eli Lilly, and Tsumura and serving as a consultant for Meiji. Dr Wada reports receiving honoraria from Shionogi, Eisai, GlaxoSmithKline, Otsuka, Kyowahakko-Kirin, Pfizer, Tanabe-Mitsubishi, Novartis, and Meiji. Dr Takeuchi reports receiving honoraria from Otsuka, GlaxoSmithKline, Merck Sharp & Dohme, Dainippon-Sumitomo, Janssen, Eli Lilly, and Daiichi-Sankyo, and Shionogi. Dr Odawara reports receiving honoraria from Eisai, Ono, Janssen, Otsuka, Daiichi-Sankyo, Mochida, Novartis, Eli Lilly, Yoshitomi, Takeda, Shionogi, and Astellas and serving as a consultant for Otsuka, Ono, and Dainippon-Sumitomo. Dr Usui reports receiving honoraria from Shionogi and Pfizer and serving as consultant for Pfizer. Dr Nakamura reports no conflicts. Funding/Support: This work was supported by the Japan Society for the Promotion of Science (Grant-in-Aid for Scientific Research [C] 23591728). Group Information: The DELIRIA-J Group members are K. H., Y. K., K. W., T. T., T. O., C. U., H. N., Yutaka Machida, MD, PhD, Shigeo Ito, MD, PhD, Yukitaka Morita, MD, PhD, and Takashi Iwamoto, MD. Previous Presentation: This paper was presented in part at the 11th World Congress of Biological Psychiatry; June 25, 2013; Kyoto, Japan.